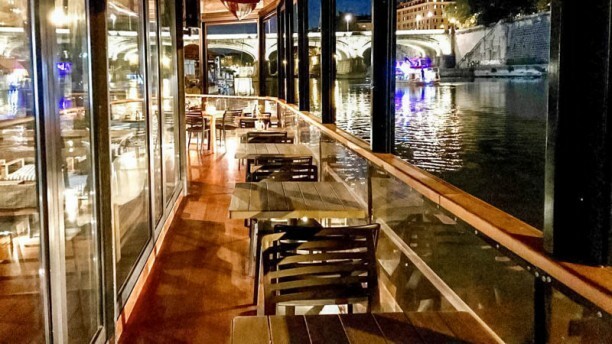 FEATURE - Nearby the Piazza del Popolo, on theTiber banks stands Baja Restaurant. A suggestive location, decorated with a touch of liberty style and developed on two different floors. The windows of the property allows to enjoy the surrounding panorama throughout the year. MENU- The menu of the restaurant proposes a wide selection of courses, not only meat and fish, prepared according to the recipes of the Roman tradition, with incursion of a mediterranean tradition. WINE CELLAR-The wine card offers a wide selection of labels, ideal to be matched with the chosen dish. My favourite restaurant in Rome. Location splendida e suggestiva, cucina ottima! Highly recommended for a romantic dinner in the heart of Rome. Dishes are delicious and the scene is really cool. Prices are higher than average but matched by great quality of the food and presentation was also amazing. I was underwhelmed by this restaurant. The service was a bit slow the menu quite limited and the food only good not really lovely. We had pasta (€12-14) and steaks (€20-22) and a bottle of wine our bill was about €130. The wine selection was over priced and I wasn't impressed with our €36 bottle. The venue is pretty but doesn't have views of Rome as the river walls are very high. After dinner we finished our wine in the lounge area which was relaxed and had a nice atmosphere. I think I'd return for a drink but not for dinner. Cocktail selection a bit dull but a good range of gins. Again proves quite expensive €10 for cocktails €12 for gins. tagliolini all 'astice favolosi !! Lovely food. Only had italian menu to start with so guessed our starters and mains but what we received was amazing. Would return. Steak was perfect. Best meal in Italy so far. The food was perfect. The steak was cooked medium which was exactly that. All the food was presented Extremely well. Amazing wine. And an overall brilliant atmosphere. Would highly Recommended it. It’s one of the places you must stop and have dinner in Rome. Food was good, setting was absolutely beautiful but the service was quite poor. Perfect setting, great service and absolutely delicious dinner!! Unparalled location and atmosphere. Vittoria, our waitress, became our friend. And of course, the food was delicious. We had three waiter, Nobody felt responsible for us. We had always to ask that somebody would take our order. Water did not come, only After several times asking for it. Asking for help choosing the wine, they just served us a bottle, without explaination. Food was ok, bread was served After Dinner. It was my Husband Birthday, which I told them before. I paid the Bill at the Counter, because Nobody gave us the Bill, After asking again and again. We left and celebrate somewhere else. Our First Hours in Rom, so disapointing!!!! When we left the waiter was Running After us, asking why we left, he ofered us a bottle of wine. Nice, But the Special day / Night was ruined. Una conferma. Da provare il pokė.